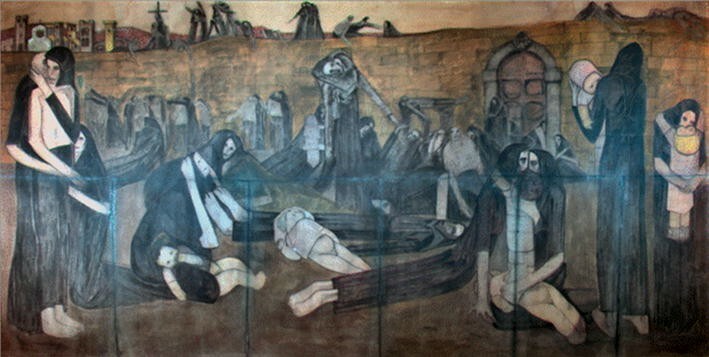 “The Plague in Lucca”, a masterpiece of the contemporary painter Lorenzo Viani, was studied by multi-analytical techniques (Multiband, IR and UV fluorescence imaging, micro-Raman spectroscopy, direct exposure–mass spectrometry, gas chromatography–mass spectrometry and energy dispersive X-ray fluorescence) in view of its restoration at the Gallery of Modern and Contemporary Art (GAMC) of Palazzo delle Muse in Viareggio (Lucca, Italy). The analysis allowed to obtain a better understanding of the artistic technique of the painter and to underline critical conservation aspects. At first, non-invasive techniques, such as the Multiband Imaging, Infrared Reflectometry, UV Fluorescence and X-ray Fluorescence, have been applied in order to characterize the conservation state of the painting surface and determining the more representative zones of the painting for the taking of micro-samples to be analysed in the laboratory. The destructive chemical analysis of these micro-samples, performed using mass (DEMS and GC/MS) and infrared spectroscopy (micro-Raman), permitted to reveal the nature of the organic and inorganic materials present in the painting. The use of different physical and chemical diagnostic techniques allowed us to obtain precious information about the palette and the technique used by Lorenzo Viani for the realization of “La Peste a Lucca”. Furthermore, this approach permit to characterize paintings, to understand the nature and origin of materials used by the artist and to develop the appropriate restoration procedure. The desire to understand the painting masterpieces and tell the story behind them has driven the science to develop more and more sophisticated analytical chemical procedures and instrumental techniques. As a result, successful multidisciplinary collaborations have flourished among researchers in museums, conservation institutions, universities and scientific laboratories. Paintings, composed of multiple layers of various materials (binders, pigments, fillers and dryers, preparation and support) undergo degradation leading to change of the physical stability and appearance: up to now, they have been investigated to identify the original composition of the materials but only seldom to understand the degradation processes which occur over time and which may have significant effects on their properties. For instance, many modern materials composing works of art are inherently unstable and there is the need to early recognize the deterioration reactions in order to apply methods to prevent or delay the decay [1, 2]. Over the past two decades, particular attention has been focused on the characterization of inorganic and organic materials occurring as binders, organic dyes and varnishes in paintings: the mixture of many materials and the chemical changes induced by ageing, long term chemical reactions with pigments, and environmental pollution make the study difficult and challenging [3, 4]. Therefore, the use of advanced analytical technologies and techniques to understand the material behavior and to develop methods for material stabilization, strengthening, monitoring, and repair is fundamental. Such chemical-physical approaches permit to characterize paintings, to understand the nature and origin of materials used to create a work-of-art, and to highlight the degradation processes undergone. This knowledge allows us to understand the painting technique and to choose the appropriate restoration procedure. The heterogeneous material composition and the complex multi-layer composition of paintings makes the approach to their scientific investigation very challenging, particularly when considering organic substances, that are of primary importance in revealing the painting technique used by the artist and in choosing compatible restoration materials to repair it. Actually, the study the nature of organic substances, due by their variable composition and their propensity to undergo chemical and biological degradation processes is one of the most difficult task. Furthermore, the modern and contemporary paintings pose specific problems for the identification of the technique used by the artist , because of the large and often undocumented use of materials not specifically devised for that purpose and, in some cases, the deliberate intention of the artist of creating an ephemeral work of art . Generally, the most common analytical approaches for the analysis of organic materials in contemporary paintings are based on mass spectrometry analysis, such as gas chromatography (GC/MS) and pyrolysis (Py–GC/MS and/or DEMS) [7–10]. Furthermore, the application of optical and infrared spectroscopic techniques to the study of contemporary art has been the subject of a number of research papers in recent years [11–14], as in general the analysis of Cultural Heritage has taken advantage of the typical benefits of this spectroscopic analysis, both for in situ [15–17] and laboratory [18–20] analysis. 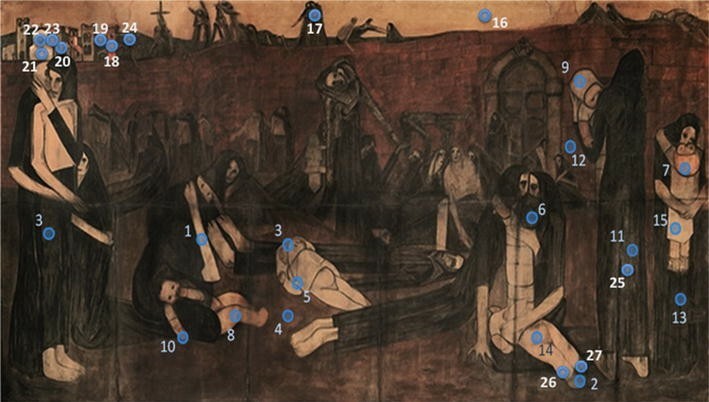 This paper focuses on the examination of a large oil on canvas, “La Peste a Lucca (i Lebbrosi)” (“The Plague in Lucca (Lepers)”) (200 cm × 400 cm) which was painted by Lorenzo Viani between 1913 and 1915 (Fig. 1). Coming from a private collection, the canvas is part of an ensemble of other two coeval equal-in-size paintings: “Il Volto Santo”, and “La benedizione dei morti del mare”. Even though it has its own life, the painting acquires additional meaning if enlightened by the presence of the others. The painting “The Plague in Lucca” of Lorenzo Viani (before restoration). The painting is built according to a carefully-balanced design, and consists of a rigorous architecture characterized by three groups of figures that draw the vertical end of an imaginary triangle, in which men, women, children lie, awaiting the inexorable destiny; some lepers seem to arise from the foreground because of their pale skin and bandages, while others sink into the dark and ochre background. Both background and foreground figure are a choral hymn about the misery of life and the ineluctability of death. The symbolic mystical religious value and the intense emotional impact of the picture evoke—for what concerns the foreground—the iconography of the Danse macabre and Totentanz of the French and German medieval xylography . As in a funeral march the leper’s silhouettes move towards the utopian city of Lucca—as it was a New Jerusalem—with an agonizing pace of a procession to calvary. Critics have Lorenzo Viani’s “La peste a Lucca” as inspired by figurative northern European expressionism and by French medieval iconography. The same Viani’s graphic work and technical style has its ground on the same sources of inspiration. This leads to peculiar features present in almost all of Viani’s production such as his intense and evocative deformed figures, his scratched style, and the technique of applying colours as a continuous with thick black edges. The scarcity of the artistic media is a precise choice of the artist: the painting is rough and simple, in order to tell the hunger, the prison, the disease, the loneliness, the war, the madness and the pain [22, 23]. Together with the thin layer of painting, Viani was making a point in using a very simple palette, dominated by dark colours: “I must keep in mind to use only few colours with special consideration for ivory black and earth tones such as red, yellow and green, in order to obtain austere and realistic tonalities. Hues such as baby blue, blue, emerald green, orange and all bright colours in general can be deceiving as they evoke sensuality, while black, being a sober hue is undoubtedly an artist’s privileged matter, a powerful and fundamental means of expression” . Some of the works of Lorenzo Viani, such as “The Plague in Lucca”, have suffered of a series of conservation problems, which deeply compromised the same physical integrity of the artworks and calls for important conservation interventions. 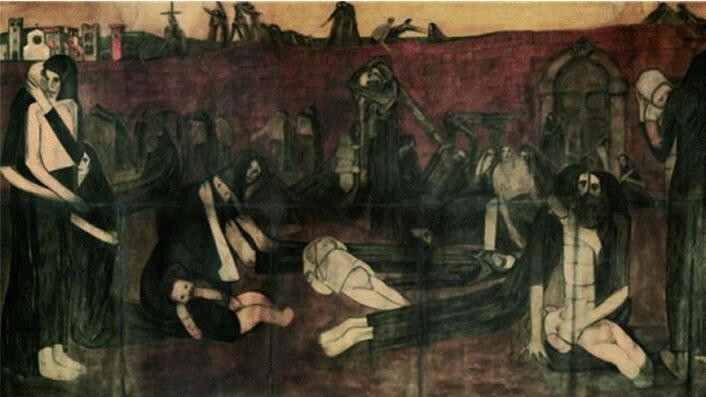 During World War II, the painting “The Plague in Lucca” was divided into several parts, probably to save it from the raids of the German Army: the upper part was rolled and stored underground, the bottom again divided into 6 pieces and hidden. In the after war restoration, a pigmented filling material was used to repair lacerations of canvas. The canvas was relined probably by using animal glue; the not original industrial frame permits a relatively good tension of the original and relined canvas. Nowadays the painting shows a darkening of the pigments, several stains mainly in the upper part caused by humidity; nevertheless, the thin paint layer is well adherent to the canvas and no craquelures are visible. Although the painting was already restored in the past, the critical conditions together with the thinness of the paint required a new intervention, that was realized by one of the authors (LB), on the basis of the indications obtained by the diagnostic analysis performed by this multidisciplinary research team and described in the present paper. The choice of the analytical protocol to analyse this case of modern art has been particularly challenging due to the vast range of inorganic and organic materials that constitute the work-of-art: imaging techniques (Multiband Imaging, Infrared Reflectometry and UV Fluorescence), X-ray fluorescence, micro-Raman, Py–GC–MS, GC–MS have been used to characterise the materials, to identify the techniques used by Lorenzo Viani and to choose the best preservation procedure. The application of non invasive imaging techniques has allowed us to drastically reduce the number of representative micro-samples to be taken from different parts of the painting. The chosen analytical protocol consists of applying first the non invasive techniques Multiband Imaging, Infrared Reflectometry, UV Fluorescence and X-ray Fluorescence directly on the painting surface [25–27]. On the basis of these results, four micro-samples were taken from different parts of the canvas in order to determine the nature of the inorganic and organic materials used by the artist with micro-Raman and mass spectrometry techniques. The sampling points are shown in Fig. 2. The results obtained from the multi-analytical approach (Visible, Infrared and Fluorescence Imaging, X-ray fluorescence, micro-Raman, Py–GC–MS and GC/MS) of the painting “The Plague of Lucca” give information about the artist’s palette, reveals the presence of a few retouching and the nature of the support, the binder and varnish materials. The combination of the results obtained from these complementary analytical techniques permits to understand better the history of the painting and to choose the best restoration approach. In the following paragraphs, the results for each technique are discussed. The infrared image of the painting acquired at the central band of 1,025 nm (Fig. 3) evidences that the underdrawing coincides with the pictorial layer. A few retouches are visible, which appear more evident in the false colour IR image (Fig. 4) obtained combining the images taken at 550 nm (green band, used as the blue channel of the resulting false colour image), 600 nm (red band, used as the green one) and IR at 1,025 nm (used as the red channel). The UV–visible fluorescence image was obtained by illuminating the painting with ultraviolet light, and acquiring the fluorescence signal in the three visible bands of red, green and blue (RGB). This image shows a different fluorescence in the areas where a preliminary visual inspection evidenced losses of color and the consequent exposition of the priming of the canvas. 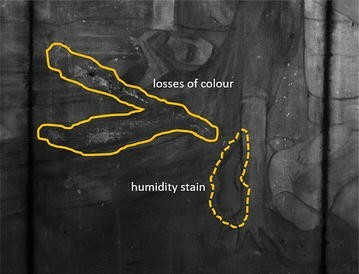 Furthermore, the visually observed presence of humidity stains confirms the conservation problems suffered by the painting (see Fig. 5). Infrared image of the painting acquired at the central band of 1,025 nm. False color IR image obtained combining the images taken at 550 nm, 600 nm and IR at 1,025 nm. The image evidences losses of color (continuous line) and humidity stains (dashed line). The XRF analysis was performed on 27 different points as shown in Fig. 6 and evidenced the presence of lead in all the points analysed: this element is possibly associated to a light white lead preparation applied by the artist on the canvas. The skin tones (points 1, 8, 10, 14, 26) contain mercury, indicating the use of vermillion (HgS). In all points, except point 10, the presence of zinc is detectable, possibly associated to the use of the zinc white pigment. The soil (point 4) is probably realized using a red ochre (iron oxide) although iron is present, at different extents, in all the points of the painting measured. All the black dresses (points 11, 17, 25) are not evidencing characteristic elements; this behaviour is compatible with the use of ivory black, a black carbon-based pigment which does not respond to XRF analysis. Due to the limitation of our portable XRF instrument we were not able to detect phosphorous, which should be present in the ivory black pigment, while the presence of calcium is not adding information because of the environmental interferences. The socks and the blue hairnet of the baby at the bottom right of the painting (points 2, 9, 27) show the presence of chromium; the same element is present with barium on the blonde hair of the little girl, in the locket and the orange hairnet (points 3, 5 and 7), pointing to the use of barium chromate, a bright yellow pigment. In some points (6, 12 and 13) the presence of manganese and iron could suggest the use of umber (iron oxide and manganese oxide). In particular in the grey dress (point 11) umber could have been used for the shades. In the upper part of the canvas, the sky (point 16) is probably realized with a yellow ochre (iron oxide), the red tower (point 18) and the rose window (point 22) are painted using vermillion. In the bell tower (point 20) the presence of chromium could suggest the use of a mix of vermillion and chrome green. The XRF spectrum of the walls of the church (points 21 and 23) shows the presence of only zinc and lead, suggesting the possible use of zinc white on top of the lead white preparation. Finally, the mountains in the background (points 19 and 24) are realized in green ochre. Figure 7 shows the most representative XRF spectra described above. The 27 points analyzed by XRF technique. Sample 1, taken from the pigmented filling material covering the canvas cuts, showed a good Raman signal (Fig. 8a), which allowed the identification of the characteristic vibration bands at 415 and 1,007 cm−1 of gypsum (CaSO4·2H2O). The bands at 1,348 and 1,606 cm−1 corresponds to (C–C) and (C=C) bonds, respectively. It is thus probable that the pigmented filling material was made by gypsum, while the carbon–carbon vibrations indicate the presence of amorphous carbon, either deriving from a black pigment of vegetal origin used for colouring the filling material or indicating the degradation of some organic material on the painting surface. Unfortunately, samples from 2 to 4 gave no interpretable signals, because of a strong fluorescence background signal that obliterated the Raman signal (see Fig. 8b). The preliminary analysis by direct exposure–mass spectrometry analysis (DEMS) of the four samples permitted to reveal the nature of the organic materials on the canvas. The DEMS results reveal that the most abundant organic material is a proteinaceous material which is associated to the typical ionic fragments with 67, 79, 84, 91, 107, 108, 117, 131, 145 and 186 m/z. Moreover, in samples 2, 4 and, at a less extent, in sample 1, the lipidic material is identified by the ionic fragments with 91, 105, 115, 129, 138, 155, 166, 256, 268, 282, 284, 313 and 341 m/z. The gas chromatography-mass spectrometry (GC–MS) approach permitted to determine in the micro-samples 1, 2 and 4 the occurrence of a proteinaceous material above the quantification limit, while sample 3 showed a proteinaceous content between the quantification and the detection limit. The amino acid content of the samples and the quantity of the proteinaceous material are reported in Table 1. The hydroxyproline is an indicator of animal glue presence: a quite high content in samples 1 and 4, lower in samples 2 and 3 [28–30]. The relative amino acid content in the samples was compared with 121 reference samples using the Principal Component Analysis (PCA) method, which confirms the presence of animal glue (see Fig. 9), probably connected to the relining process of the canvas. Presence of animal glue confirmed by Principal Component Analysis (PCA) method. The chromatogram of the lipidic-resinous fraction evidenced a lipidic composition in the samples 1, 2 and 3 at the level of the instrumental blank, while in sample 4 a lipidic material of vegetal origin was identified (Fig. 10). Moreover, the abundant presence of oxidation products such as dicarboxylic acids (suberic and azelaic acids) characterizes the material as siccative oil, thus confirming the medium used by Viani [10, 31, 32]. According to the characteristic ratio values of palmitic to stearic acid, the drying oil may be recognised as linseed oil. It should be also noted that the not detectability of siccative oil in the other samples is due to the small sample size which gave signals at the detection limit. ​Sample 4 chromatogram that indicates a lipidic material of vegetal origin. In the chromatogram of samples 3 and 4, the presence of dehydroabietic and 7-oxo-dehydroabietic acid, associated to colophony resin, was also identified [29, 33, 34]. This resin is less abundant than the siccative oil, and could be associated to the use of a varnish in the past. However, it cannot be excluded the possibility that colophony resin could have been added to the animal glue, as used traditionally in the preparation of the colla-pasta for the relining of the canvas. The use of different diagnostic techniques, both physical (Imaging, XRF) and chemical (micro-Raman, DE–MS and GC–MS), allowed us to obtain precious information about the palette and the technique used by Lorenzo Viani for the realization of “La Peste a Lucca”. The presence of humidity stains, the localized loss of color and some abrasion of the painted surface were evidenced using multiband imaging, infrared reflectometry and UV–visible fluorescence. The XRF analysis allowed to determine the presence of a relatively variegated palette (red, green and yellow ochre, umber, vermillion, barium chromate, zinc and lead white), surely more rich than expected, considering the predilection of the artist for ivory and carbon blacks. The chemical analysis evidenced that animal glue was present throughout all the painting and that linseed oil and colophonia were used. The micro-Raman analysis of the coloured filling material, used in a previous restoration for covering the junction of the different parts of the painting, revealed the presence of gypsum, coloured presumably with a carbon-based vegetal pigment. The cleaning of the surface was then performed by the restorer (LB) with soft methods by using wishab rubber and agar gel. The filling material was removed and the vacancies integrated with camouflage and dots. The restoration of the painting, executed on the basis of the above findings, was terminated at the end of 2013, bringing back to the owner and the population a masterpiece of extraordinary emotional intensity. The multiband and fluorescence images were acquired using a 8.3 Megapixels Chroma C4 scientific camera from DTA Scientific Instruments s.r.l. Two series of multi-band images were acquired of the left and right parts of the artwork using six interferential filters (centered at 400, 450, 550, 600, 750 and 1,050 nm, with bandpass ± 25 nm) in front of the CCD sensor. All the images were white-balanced using as a reference a Spectralon and then reunited to form single high resolution images of the whole painting. For the specific information sought in our work, we used the classical four bands (RGB + IR) for building RGB, False Colours and UV–Visible fluorescence images). The UV–Visible fluorescence image was obtained illuminating the painting with high pressure Hg lamps. The palette used by Lorenzo Viani for the realization of his “La Peste in Lucca” was determined in situ and non-destructively using the X-ray Fluorescence (XRF) technique . We used a commercial instrument from Amptek Inc. (USA) equipped with a 40 keV/200 μA X-ray tube (W electrode, 2 mm collimated beam on the sample) and with an Energy Dispersive Si-Drift X-ray spectrometer (145 eV FWHM at 5.9 keV). The analysis was performed at the Applied and Laser Spectroscopy Laboratory using a Renishaw Invia Raman microscope. The laser source was a He–Ne laser (633 nm) with a 50× objective. The direct exposure–mass spectrometry (DE–MS) measurements on the four micro-samples were performed at the SCIBEC laboratory of the University of Pisa. The technique allows to obtain the mass spectrum of the pyrolysis and volatile products of a sample in very short time and without any pre-treatment. The solid sample (few grains, <0.1 mg) was placed on the rhenium filament of Direct exposure probe (DEP). The sample is pyrolysed and desorbed from a filament by controlled heating and then ionized by electron ionization impact (EI). The DEP was directly inserted in the ion source of a Polaris Q Thermo Finningan ion trap mass spectrometer. The conditions for the resistive heating of the probe were: 0 mA for 30 s, from 0 to 1,000 mA in 50 s, then 1,000 mA for 60 s. MS ionization: electronic impact at 70 eV. Temperature of the ion source: 230°C. The mass spectrometer was scanned over an m/z range 50–650. Thus, it is possible to obtain a graph representing the total ion current (TIC) in function of the time and a set of mass spectral data, averaging the mass spectra in the pyrolysis time range. The samples were analysed by GC–MS applying an analytical procedure for the determination of the proteins (animal glue, egg, milk or casein), glycerolipids (egg, oil), natural waxes (bee wax, Carnauba wax), vegetal resins (Pinaceae, mastic, dammar, sandarac) and animal resins (shellac) in the same sample of few hundreds of micrograms . The samples are subjected to an ammonia extraction, to separate proteins from lipids and resins. Proteins are then determined after hydrolysis assisted by microwaves, derivatisation with a silylating agent and GC/MS of the amino acids. Lipids and resins are then subjected to a saponification step assisted by microwaves followed by GC/MS analyses of neutral and acidic compounds obtained after solvent extraction and derivatisation with a silylating agent. The Gas Chromatograph System 6890N (Agilent Technologies, Palo Alto, CA, USA) was coupled with a 5,973 Mass Selective Detector (Agilent Technologies, Palo Alto, CA, USA) single-quadrupole mass spectrometer. For the gas chromatographic separation, an HP-5MS fused silica capillary column (5% diphenyl- 95% dimethyl-polysiloxane, 30 m × 0.25 mm i.d., J&W Scientific Agilent Technologies, USA) with a de-activated silica pre-column (2 m × 0.32 mm i.d., J&W Scientific Agilent Technologies, USA) was used. The split-splitless injector was used in splitless mode at 320°C. The GC/MS parameters for the analysis of the different fractions are as follows: 80°C isothermal for 2 min, 10°C min−1 up 200°C and isothermal for 4 min, 6°C min−1 up 280°C and isothermal for 40 min. The carrier gas (He, purity 99.9995%) was used in the constant flow mode at 1.2 mL min−1. Peaks assignments were performed using mass spectra interpretation, comparisons with mass spectral libraries (NIST 2.0) and with published mass spectra. EG: conceived and designed the experiments,​ performed the Multiband, IR and UV Fluorescence Imaging experiments, analyzed related data, gave advice about technical-conservative aspects of the painting, wrote the paper, prepared figures and/or tables, reviewed drafts of the paper. LB: gave advice about technical-conservative aspects of the painting, interpreted the analytical data preparatory to the restoration. MPC: conceived and designed the experiments, performed sampling, analyzed DEMS and GC/MS data, wrote the paper, reviewed drafts of the paper. LM: performed the IR and UV Fluorescence Imaging experiments, elaborated Multiband images, perfomed the XRF experiments, analyzed related data. SO: performed DEMS and GC/MS experiments, analyzed related data, reviewed drafts of the paper. SL: conceived and designed the experiments, analyzed XRF and Raman data, wrote the paper, reviewed drafts of the paper. ML: performed the computation work. GL: performed Raman experiments, analyzed XRF and Raman data, wrote the paper, reviewed drafts of the paper. SP: performed the computation work. VP: conceived, designed the experiments, supervised XRF and Raman experiments, wrote the paper, reviewed drafts of the paper. All authors read and approved the final manuscript.